This week’s recipe is one of the simplest I’ve ever posted. So simple, in fact, you might wonder why I even bothered. So often, folks have such little faith in Mother Nature when it comes to the flavor of vegetables. Many feel the need to cover them with seasonings and sauces and cheeses to “make them flavorful”. What I wish more people would embrace is the Mother-given deliciousness of these foods. All one really needs is a bit of oil, salt, and pepper to make fresh veggies shine on the dinner plate. Each little veggie has its own wonderful flavor: savory, sweet, creamy, or earthy. Oven roasting, with very little preparation (or work of any kind on your part) is the best way to draw out the naturally crave-able flavors of these gifts from the earth. It’s my very favorite way to cook vegetables, even though I have very little to do with the flavor of the end result. Never fear, I won’t totally deprive you of the feeling that you’ve really done something amazing… we’re going to add some fresh herbs and a sprinkling of Parmesan for a little extra oomph (not that they need it). First, preheat the oven to 450. Once you have all over the vegetables cut to a similar size, put them in a large bowl. Drizzle with olive oil and toss well to coat everything evenly (add a little more oil if you need). Next, add salt, pepper, and the herbs and toss again. Spray the pan(s) with cooking spray, or rub with a little more olive oil, then, spread the veggies out in a single layer on the pan(s), but don’t crowd them. Leave a couple centimeters between each piece, otherwise, they will steam from their own moisture and not get a good roasting. Put them in the hot oven for 15 minutes. Check them for doneness with a toothpick. If the potatoes are still a little too firm, go another 5 minutes. 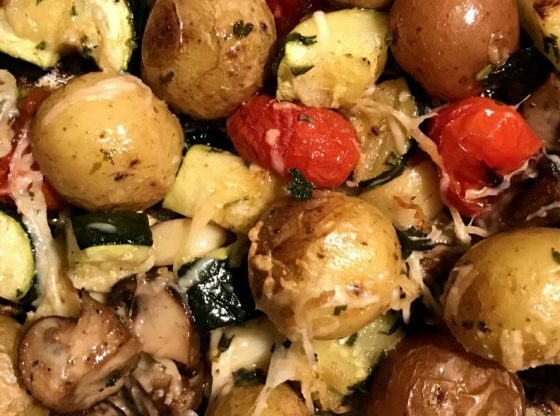 Once the potatoes are done, pull out the veggies and turn on the broiler. Sprinkle the tops with a little Parmesan and return to the broiler for 2-3 minutes, just until the cheese is melted. Serve piping hot.